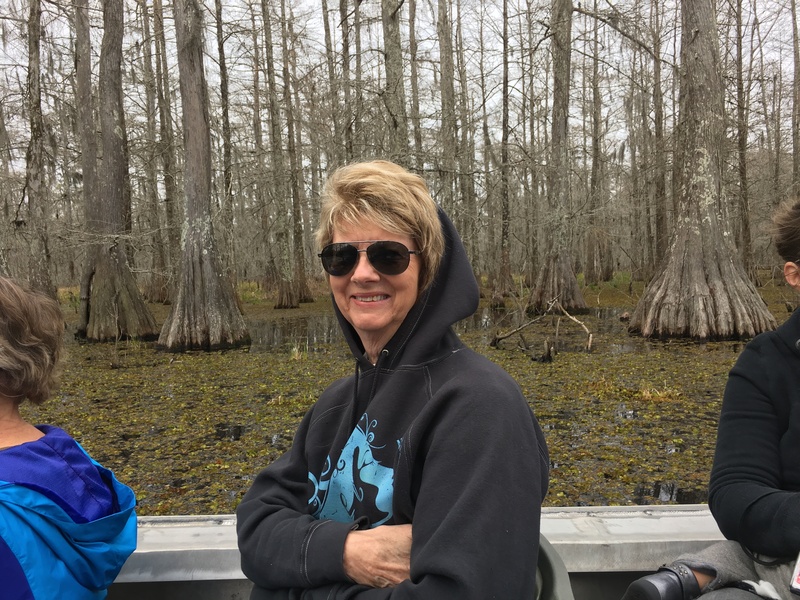 Breaux Bridge – Let's Go RVing! Since the weather forecast has rain coming in we decided to try to do the swamp tour today. I called at 9:00 and they told us they had an 11:00 tour so we made reservations knowing that it took an hour to get there! We got busy and hit the road a little after 9:30. 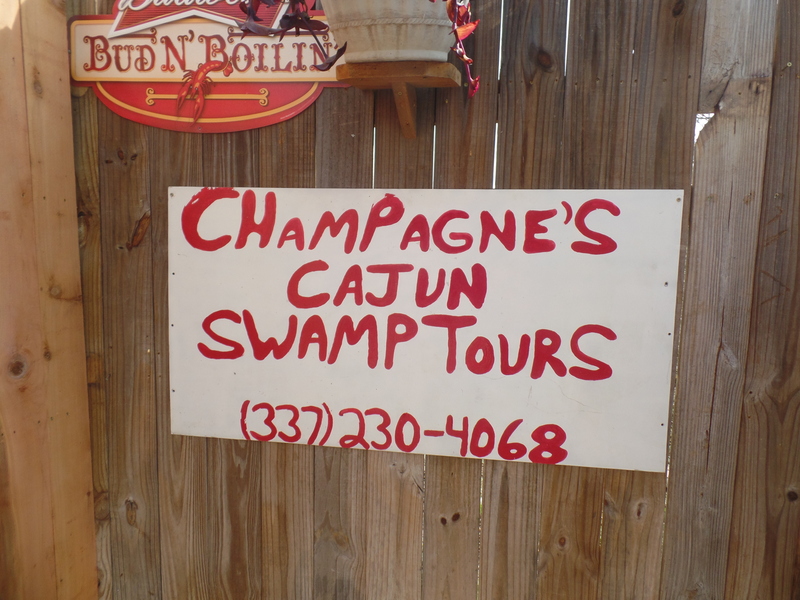 We had to go right through Lafayette so that slowed us down a bit and we got to Champagne’s Cajun Swamp Tours outside of Breaux Bridge, La about two minutes before 11:00. Jerry jumped out and went in to buy the tickets and I parked the car. We weren’t sure whether or not to take a heavy coat although the temperature was nearly 70 but cloudy. We ended up in heavy sweatshirts that were at times not enough and others too much! 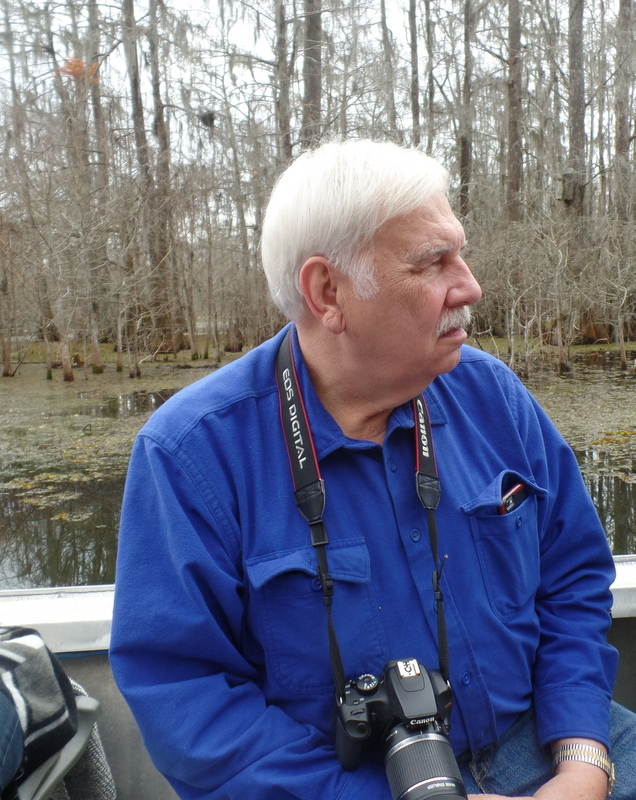 There were about 20 people on the boat and the tour covered the Lake Martin Cypress Island Preserve Swamp. The swamp is actually a dead forest with bayous which are slow moving streams of water. For some reason mosquitoes are repelled in the swamp and there were none! I never thought about mosquito repellent – glad we didn’t need it! We saw several large cypress trees one at least 500 years old. As long as the trees are going straight up they are alive. When it dies the tree begins shedding limbs from the bottom. The entire route was filled with withered trunks and tenuous arms with moss hanging down from the bare branches. Fortunately because it was in January we didn’t see any of the usually prevalent cottonmouth moccasins. We saw several duck blinds and two deer stands. The deer stands were rusty oil barrels up in the trees. The guide didn’t seem to know how the hunters got up or down. Part of the tour route included a rookery which is restricted from mid-February through July because the birds are nesting. We saw cormorants, Big Blue Herons who sound a lot like frogs, some egrets and a variety of other birds. We also saw two gators, one about 4 ½ feet long and one about 1 ½ feet long. Gators grow a foot a year for four years and then their size is determined by environment and what they eat. They can jump as high as they are tall. That was an interesting fact – I never knew gators jumped. After the tour we went to New Iberia to try out a restaurant that had been recommended by some folks in the RV Park. Had I seen a picture earlier I probably wouldn’t have eaten there. When we pulled up Jerry asked me if I had done a search for “Hole in the Wall” places! He also said that our daughter in law’s parents traveled and when they posted pictures it looked like they ate in really up-scale places. Well, we ate at Bon Creole and looks are very deceiving. We had fried shrimp, oysters, crawfish and catfish and it was absolutely delicious. Our next stop was Rip Van Winkle Gardens where the beautiful Joseph Jefferson Mansion built in 1870 is located. The home is located on a salt dome, at an elevation of 75 feet above sea level – almost unheard of in the coastal areas of South Louisiana. It was built by the actor Joseph Jackson who started acting at four years old and became famous starring as Rip Van Winkle thus the name of the gardens in his honor. 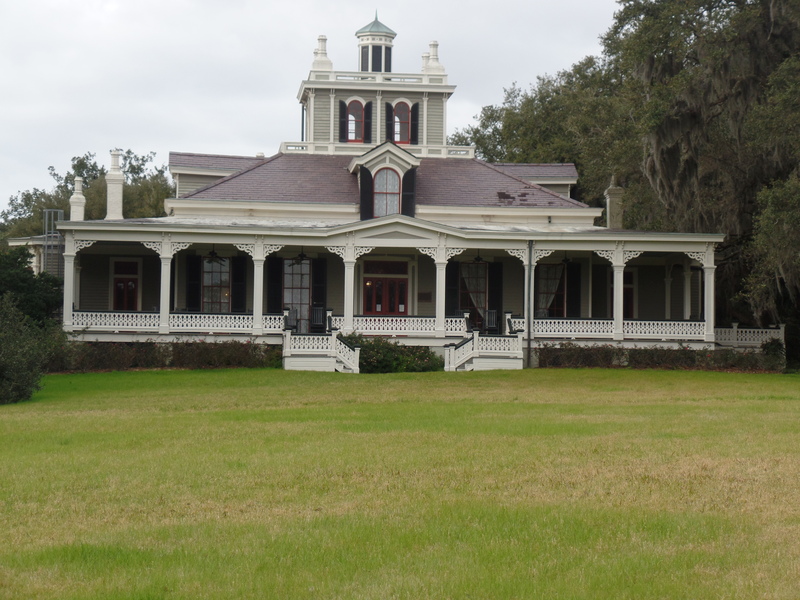 It is a typical Southern mansion with twenty-two rooms and a fourth-story cupola. You can stand in the foyer and look all the way up to the sky! We were only able to visit the first floor and it was lovely. Unfortunately the guide took us through so quickly that we felt as though we could hardy keep up. When we got back to the RV Park we talked with others who had gone on the same tour and they agreed that they had felt the same way. The furnishings are beautiful and authentic and every room is beautifully appointed. The home also had pictures of the families that had lived there. The last owner had no heirs so the home was eventually sold to the intern who had worked at the home as a gardener in his youth. The gardens are pretty and I can only imagine what they might look like in the spring. We came on back to the coach and walked over to Happy Hour with our contribution of a King Cake. We visited with a lovely couple from Canada who told me about a gator farm in Hammond. I’d love to go there but it’s a couple of hours from here so I’m not sure we’ll go. We have decided to stay until Sunday thus not visiting St. Francisville. We’ll save that for another time I guess. I think Jerry has seen enough plantations for a while! They do all seem to run together after a while. In by 6:30 and getting ready for the rain hearing thunder hopefully far off.